RECARE Danish Case Study - Techniques to minimise soil compaction from Soil Physics & Land Use PROJECTS on Vimeo. The video (in English) shows an experiment where pressures in the soil induced by wheels and tracks are compared. The video gives a good insight into the problem of soil compaction. Soil compaction research - Low-pressure tyre versus Track from Soil Physics & Land Use PROJECTS on Vimeo. The video is also available in Dutch and German. Soil compaction is a reduction in soil volume and/or a change in soil form with implications for soil pore functions. It occurs when soil is subject to stresses that exceed its strength as a result of agricultural machinery or the trampling of animals. Compaction of the topsoil has a significant impact on crop yield but amelioration by tillage and natural processes are quite effective. Compaction of the subsoil (the layers below the tillage depth) affects a range of soil ecosystem services, including crop yield. It is particularly problematic as it is invisible, cumulative and persistent. trafficked with machinery for slurry application (compacted soil to the right) 1. In principle, all soils are at risk of soil compaction because soil strength varies strongly with soil water. Maps accounting for soil type differences in strength can be produced to show soil variability in their Wheel Load Carrying Capacity (WLCC, kN) as exemplified here for a medium water content2. Generally, clay-holding soils are weak in wet conditions and strong in dry. Sandy soils vary less with water in their WLCC. Soil compaction has increased with the post-war drive to more intensive agriculture which has resulted in more frequent traffic with machinery of steadily increasing weight2. The use of wider and more voluminous tyres has not been able to counteract the increase in loads of the machinery. To secure economic viability, farmers are pushed towards unsustainable conditions. They may have the willingness but not the ability to protect their soils3. This schism is not always explicit because subsoil compaction is invisible. The DPSIR approach indicates how a response to the challenge may be activated by the farmer, addressing the immediate compaction induced soil state and its impacts. Alternatively, society intervention may modify the drivers responsible for the development and/or stipulate the specific pressures that may be exerted to the soil. The state of soil compaction may be expressed by the Relative Normalized Density (RND). It gives an indication of subsoil density relative to a natural reference state for the given soil texture. RND values higher than 1 indicate critically high densities, which has been calculated to be the case for ~23% of the total agricultural area of Europe4. Critical levels of compaction may also be judged from other soil properties like cone penetration, the volume of air-filled pores at field capacity water content, and air permeability. The stresses active in the upper soil layers are directly proportional to the stresses in the tyre-soil contact area. These are – in turn – determined by the tyre inflation pressure. The use of wide, low-pressure tyres is thus the key to minimizing compaction of the topsoil. Also the number of wheel passes should be restricted. Confining traffic to certain areas of the field (controlled traffic farming, CTF) is an option that may provide optimal growing conditions for a large part of the field. In CTF it is important to limit wheel loads to < 3 Mg in order not to inflict such high stresses in the subsoil that permanent damage will occur under the traffic lanes. High contents of soil organic matter increase topsoil resilience to compaction. Tillage as well as dry-wet and freeze-thaw cycles are effective remediation processes in the topsoil. Subsoil compaction ought to be prevented rather than repaired. Mechanical subsoiling has proven problematic and introduces vulnerability to recompaction. Root growth for ‘biological tillage’ may modify compaction damages to some extent but seems to require decades or more2. A drawback associated with modern, wide tyres is the potential of actually driving on very wet soil when the subsoil is also extremely vulnerable to plastic deformation. The stress level for deep soil layers is determined by the wheel load. The dynamics in soil water content excludes fixed thresholds for acceptable loads. This calls for a flexible tool for risk assessment for any intended traffic. This is possible with Terranimo® that calculates and compares soil strength with stress from machinery (www.terranimo.dk)5. Terranimo® may be used free of charge by farmers or any other end-user. It may be considered a potential tool in targeted society regulation of field traffic for protection of the subsoil. This is already in effect in Switzerland by a country-specific version of Terranimo® (www.terranimo.ch). A decrease in water conductivity as a result of soil compaction may induce surface runoff of water. This, in turn, may carry pollutants and nutrients directly to surface waters. Also, surface runoff may trigger sheet as well as gully erosion. In extreme precipitation events, landslides, and surface runoff may be triggered, possibly contributing to flooding. Reduced water conductivity may also induce preferential flow in the soil profile macropores, hence decreasing the soil function as a filter. Finally, a dense soil is non-optimal to a variety of soil organisms. Compaction may also reduce soil biodiversity and rooting depth, having a strong effect on water and nutrient use efficiency. 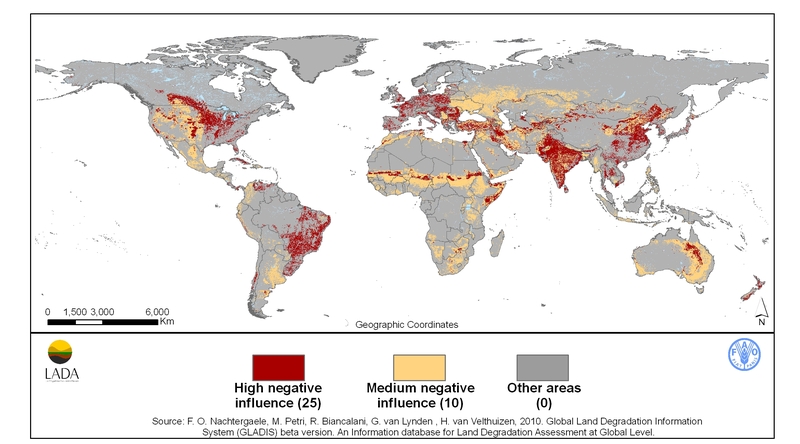 Soil compaction and disruption of soil surfaces (cyanobacteria, lichens, and mosses) caused by livestock, people, and off-road vehicles results in increased vulnerability to desertification, while compaction can also have a negative effect on hydraulic conductivity and thereby prevent salt from being leached from surface layers and increase an existing salinization problem. Ecosystem services have been defined as “the aspects of ecosystems utilized (actively or passively) to produce human well-being”6. Ecosystem services thus include crop production as well as soil interaction with the environment (e.g. filtering of pollutants, emission of greenhouse gases). The persistent nature of subsoil compaction accentuates subsoil compaction effects which will be important for generations to come. The route towards potential restrictions to farmers’ traffic in agricultural fields should be trans-disciplinary. I.e., all stakeholders should be involved in the search for solutions to the soil compaction challenge. This is in order to secure inputs from all relevant branches of expertise. Equally important, this inclusivity is needed to ensure acceptability of any restrictions that may emerge as an outcome of the evaluation. 1 Ball, B.C., Batey, T., Munkholm, L.J., Guimaraes, R.M.L., Boizard, H., McKenzie, D.C., Peigne, J., Tormena, C.A., Hargreaves, P. 2015. The numeric visual evaluation of subsoil structure (SubVESS) under agricultural production. Soil Till. Res. 148, 85-96. 2 Schjønning, P., van den Akker, J.J.H., Keller, T., Greve, M.H., Lamandé, M., Simojoki, A., Stettler, M., Arvidsson, J., Breuning-Madsen, H. 2015. Driver-Pressure-State-Impact-Response (DPSIR) analysis and risk assessment for soil compaction – a European perspective. Adv. Agron. 133, 183-237. 3 Mills, J., Gaskell, P., Reed, M., Short, C., Ingram, J., Boatman, N., Jones, N., Conyers, S., Carey, P., Winter, M., Lobley, M., 2013. Farmer attitudes and evaluation of outcomes to on-farm environmental management. Report to Department for Environment, Food and Rural Affairs (Defra). CCRI: Gloucester. 5 Lassen, P., Lamandé, M., Stettler, M., Keller, T., Jørgensen, M.S., Lilja, H., Alakukku, L., Pedersen, J., Schjønning, P. 2013. Terranimo® - A soil compaction model with internationally compatible input options. EFITA-WCCA-CIGR Conference “Sustainable Agriculture through ICT Innovation”, Turin, Italy, 24-27 June 2013, 8pp.6 Fisher, B., Turner, R.K., Morling, P. 2009. Defining and classifying ecosystem services for decision making. Ecol. Econ. 68, 643-653.